Nothing really prepares your child for a new baby’s arrival. Their safe, predictable world is suddenly filled with dirty nappies and loud crying. So, there’s no wonder if they find the whole thing a bit challenging. When you come along for our newborn session, they could quite easily see it as just another time when the baby gets all the attention. However, we can make the whole experience a positive one with some simple tips and techniques. It’s really important to help your older child/children feel part of the shoot from the moment they arrive. When you come to the studio, I like to take some time to chat with them, ask about what they like and find some common ground. Once we’ve made a connection, we can chat about their new sibling. If they’ve bought a toy for the new baby, bring it along and we’ll include it in the shoot where possible. 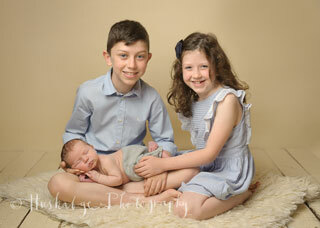 That feeling of ownership and inclusion in the shoot is really important – a proud sibling is a happy one. 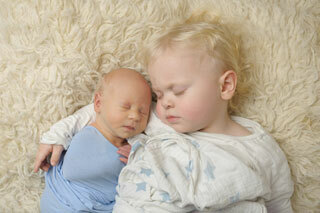 Newborn sessions last around 2-4 hours, which is a long time for young children. Don’t expect your toddler to the last whole time without becoming a bit impatient – that’s just fine. I have a box of toys in the studio but do bring along some books, games and snacks to keep your little ones occupied. 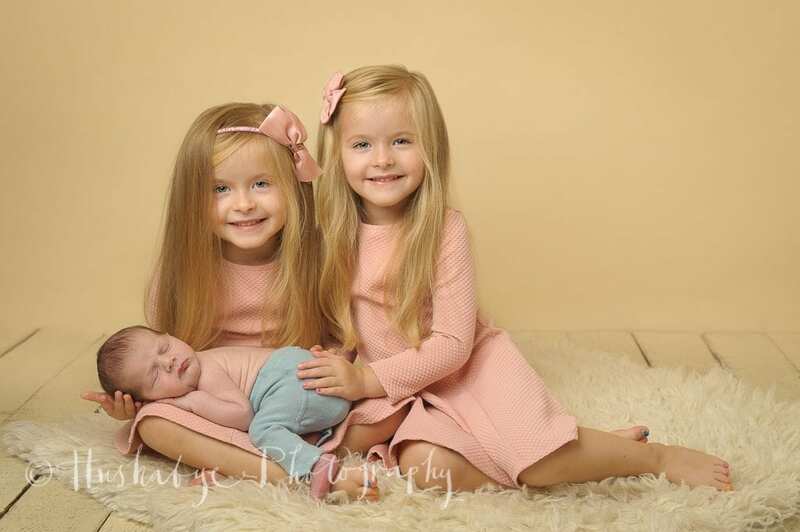 I like to start with sibling shots whenever possible, so that their patience doesn’t wear too thin! It’s good to have a plan for once we’ve got those images. Perhaps a family member or friend can whisk them away for lunch and a play. There’s a park just round the corner from the studio, which is the perfect place to take a little one who needs to let off steam. The sibling poses we try really depend on your older child’s age. 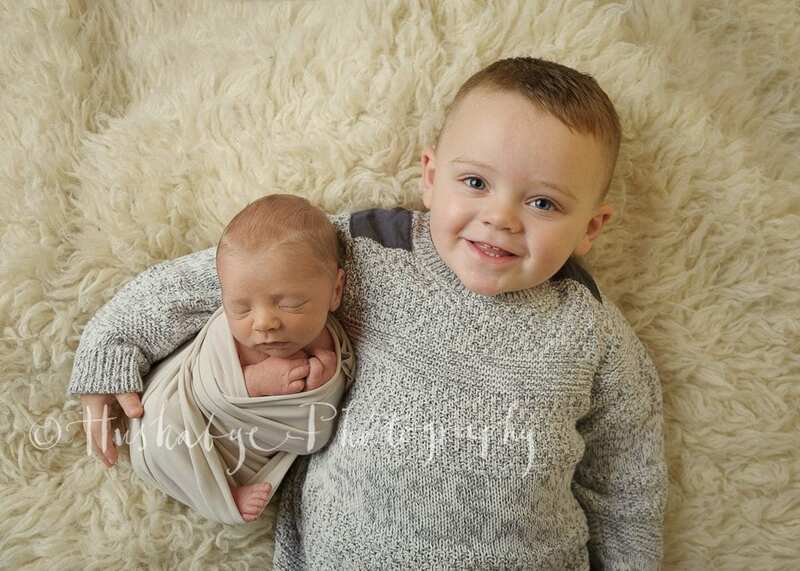 There are some poses that only an older sibling can safely attempt and some that toddlers don’t feel comfortable with. 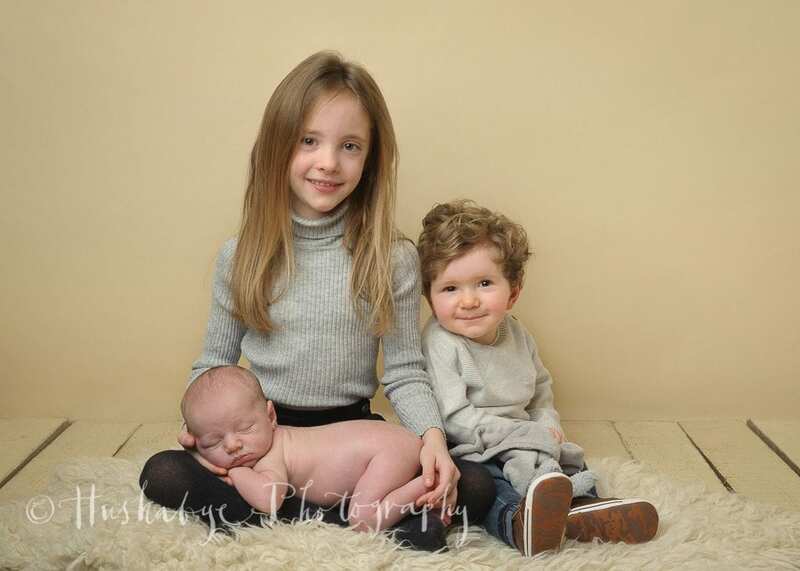 I find that, on the whole, toddlers prefer not to lie on their backs and hold their siblings so I try to sit them next to a propped shot. Older children can generally hold babies safely, with younger siblings sitting next to them. I make sure there’s always an adult close by, in case the unexpected happens. Be prepared though, sometimes a sibling will decide they just don’t want to be involved; the timing isn’t right and they don’t want a bar of it. If that’s the case, we won’t push it, there’s no sense in creating a drama where there needn’t be one. If all else fails, we have been known to wait it out and sneakily catch a couple of shots with a sound asleep toddler!! Lastly, don’t expect too much. Toddlers and older children can be impatient and grumpy, newborns cry, grown ups are exhausted – it’s all very normal. Newborn photographers are used to this, we don’t expect perfectly behaved children, or parents for that matter. We are calm, patient and very happy to wait for the right time to take the shot. Call it Photographer’s Zen if you will. The plan is for a session that everyone enjoys and that produces some beautiful images for you to treasure for life.